Murugan, also known as Kartikeya, (Tamil: முருகன்) is the Tamil god of war and victory. Muruga is the main god of worship in Tamil Nadu, South India, Sri Lanka, Mauritius and many other places where Tamilans live. He is a god with six faces. 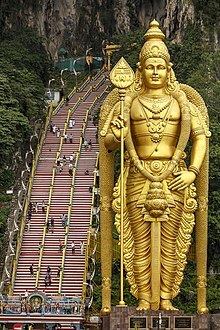 The god Murugan has six shrines in Tamil Nadu, which are known as Arupadaiveedu. In Tamil Nadu, Murugan has continued to be popular with all classes of society right since the Sangam age. This has led to more elaborate accounts of his mythology in the Tamil language, culminating in the Tamil Kandha Purānam, written by Kacchiappa Sivachariyar (1350-1420 AD) of Kumara Kottam in the city of Kanchipuram. He was a scholar in Tamil literature, and a votary of the Shaiva Siddhanta philosophy. the second of shiva he is also a the hero of some certain places. the asuras are seen as demi-gods in the buddhist and hindu religion, and those beings are always fighting with the gods because of their jelousy about the pleasure of the senses that experience the (gods) devas. ↑ Fred W. Clothey 1978, pp. 1-2. This page was last changed on 18 April 2019, at 12:04.